Gin Blanco (the Spider) returns in this the 8th instalment in Jennifer Estep’s Elemental Assassin series. In Deadly Sting, Gin finds herself attending the gala opening of an exhibit of Mab Monroe’s collection of art, jewellery and other artefacts. But when a gang of giants hold up the venue and take all the guests hostage, Gin finds herself once again cast in the role of rescuer. There is nothing subtle about this book. It’s violent, brash and in your face. Jennifer Estep beats you down with words in much the same way as her protagonist takes down her enemies with her collection of five silverstone knives. Deadly Sting is great urban fantasy. It doesn’t try to be too tricky, just delivers what fans of the genre expect. Many thanks to Pocket Books for providing me with this ARC. 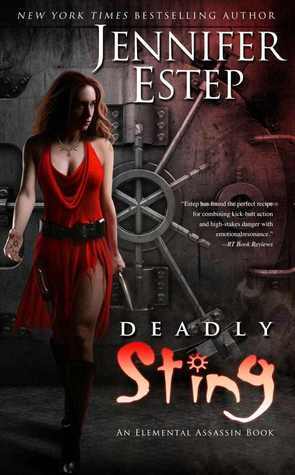 This entry was posted in Uncategorized and tagged deadly sting, elemental assassin, jennifer ester, urban fantasy by setaian. Bookmark the permalink.